Neurofeedback is a type of biofeedback that creates real time displays of brain activity. It uses and electroencephalograph or EEG to facilitate self regulation of brain function. It reads the radio frequency energy produced by the brain using extremely low levels of energy (thousands of times less than your cell phone.) Even for “healthy” people neurofeedback can help to unlock your brains potential. Neurofeedback has been proven to be effective for a wide variety of human conditions including: Traumatic Brain and Spinal Injury, Cerebral Palsy, Attachment Disorder, Autism, Asperger’s Syndrome, ADD/ADHD, Learning Disabilities, Fibromyalgia, Lyme Disease, Chronic Fatigue Syndrome, Anxiety, Depression, Phobia, Obsessive Compulsive Disorder, Panic, Bipolar Disorder, Epilepsy, Explosive Disorders, Tourette’s Syndrome, PTSD, Aneurysm, Stroke, Alzheimer’s Disease, Parkinson’s, And Headaches. In short, virtually everyone benefits in some way from receiving treatment. Treatments are done by attaching electrodes to 21 different specific sites on the human brain. Here is a map of the 21 different treatment sites on the human head. Readings are taken at each site to create a comprehensive map on the brain of an individual. 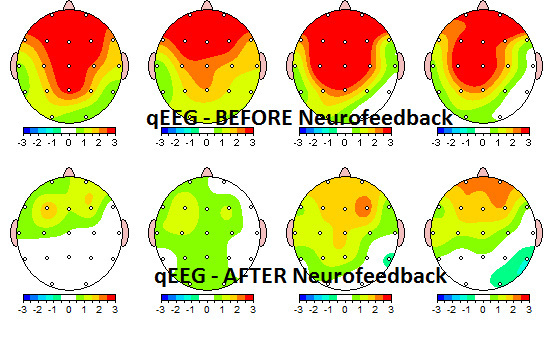 Here is an example of some before and after maps of people who have been treated with neurofeedback. I chose this as my project because I have been providing neurofeedback to people in need on a volunteer basis. This summer I treated a range of individuals who were suffering from a wide range of maladies. This included dementia, stroke victim, addiction, Lyme disease, PTSD, and Attachment Disorder. Most of my clients have improved significantly since I began treating them.